Click VOTE in menu for access to personalized voter guides, amendment info, and more! Who is Ruta Jouniari and what are her positions? Don't forget to follow her on Facebook to see her weekly Coffee with Voters - Live! Sarasota County's beauty and natural resources bring countless tourists and new residents each year. Our's is truly a special place, but remains so only because we work for it. Ruta is committed to conservation, clean air and water, and a focus on renewable energy sources. Work Here. Play Here. Live Here. Communities crumble when their most productive members, the wage earners, are no longer able to live there. We must attract new industries AND their employees. Affordable housing must be available to those in search of prosperity and the American Dream. "Note how much more knowledgeable Ruta is on the issues...I interviewed Ruta extensively and she is much more informed than her opponent." "Priorities include protection of our natural resources, support for sustainable growth, and renewable energy and the rights of citizens." 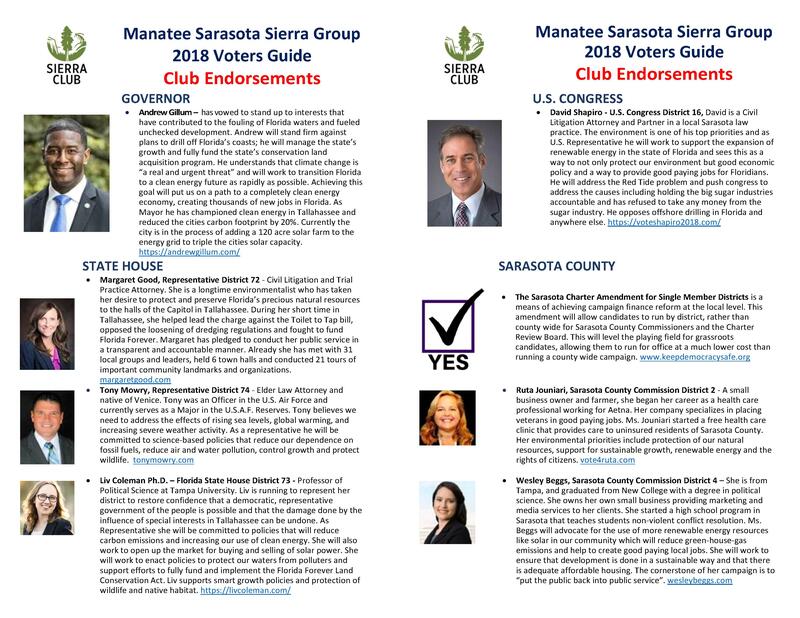 "The opinion of our Editorial Board: We recommend Ruta Maria Jouniari over Christian Ziegler for Sarasota County Commission District 2." Controlgrowthnow.org endeavors to balance the big developers who...gain at the expense of our mobility, neighborhoods, environment, schools and quality of life...and to make growth pay its own way rather than placing the costs of growth on the backs of the taxpaying public. "We are pleased to see so many...who take veteran issues seriously stepping up to serve in public office. It can only help the situation for veterans in this country to have you as an elected official so well aware of the issues facing them." Ruta Maria Jouniari is a small business owner, a small farmer, and a community health advocate. Ruta Maria began her career with Aetna U.S. Healthcare, developing markets in Boston and Tampa and fighting to lower premium costs for consumers. Fifteen years ago, Ruta Maria changed her professional focus and founded her own company, International Staffing Group, Inc., a company that places veterans in good jobs that allow them to utilize their specialized skills. Locally, Ruta Maria co-founded the Universal Crescent Clinic, a non-profit organization that provides 100% free health care to people without insurance in Sarasota County. Ruta Maria currently serves on the organization’s board of directors and volunteers at the clinic on Saturdays. Ruta Maria is the Boston-born daughter of Lithuanian immigrants. She lives in Sarasota with her husband of 19 years and her 97-year-old mother, for whom she provides primary care.